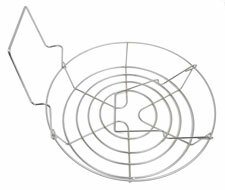 A wire canning rack is essential for water bath canning. Constructed of galvanized steel and available in three sizes. Fits most water bath canners. Measurements are given in LxWxH. 11 1/2Qt. rack measures - 10.125 x 10.125 x 13"
21Qt. rack measures - 12.125 x 12.125 x 10.25"
33Qt. rack measures - 14.4 x 14.4 x 4.1"